Nothing like a lazy day by the pool to get your groove back. Challenge the kids to a fierce game of HORSE. Take an hour after dinner and head for the bleep-bleeping sounds and flashing lights of the arcade. No need to go all-out gourmet - the kids are perfectly happy with your fastest, easiest go-to's. This resort offers a free shuttle to Walt Disney World®. You're a 10 minute drive away from both Disney's Lake Buena Vista Golf Course and Villas of Grand Cypress Orlando Golf Course! Hawthorn Suites by Wyndham Lake Buena Vista, a staySky Hotel makes the ideal home base no matter what’s on your agenda for the week. 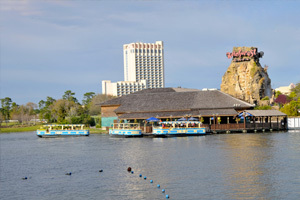 The resort is located in Lake Buena Vista, known for its “sweet spot” proximity to all things family fun. When you check in, stop by your condo to drop off your luggage – don’t bother unpacking, there will be plenty of time for that later! Change into swimsuits, grab goggles, pool toys and water wings. Spray everyone head to toe in sunscreen and get ready to hit the heated outdoor pool. Grab a lounge chair and get comfortable, you’re going to be here for a while. Thinking burgers for lunch? Take advantage of the poolside bbq grills and have a family cookout. Recruit the kids to help carry burgers, hot dogs and side-dishes. Then lay out the condiments and toppings and let everyone have at it. Get your cardio on at the fitness center or basketball court while the kids play in the arcade. Just be sure to hurry back for the complimentary manager’s reception (beer, wine and snacks) Monday through Friday. Spacious one bedroom condos sleep four to six guests and offer fully equipped kitchens that allow you to save money by making your own meals. Bring the kids along to Publix to stock up on everyone’s favorites, but don’t go too crazy loading up on morning meal groceries – the resort offers a complimentary daily hot breakfast. Living areas have plenty of room for the kids and all of their blankets, toys and imaginary friends. The cable TV provides in-suite entertainment. Gather everyone on the couch, put one of the kids in charge of the remote and another in charge of snacks and get ready for a low-key night in. There’s so much to do nearby; a spreadsheet may be in order. Or go old-school and ask for a raise of hands. Walt Disney World® on the docket? Skip the lines with a quick stop at the on-site ticket desk, then catch the free shuttle to and from the park. If you want to experience the classic Disney attractions, Magic Kingdom® is the place to go. Classics include Pirates of the Caribbean®, Dumbo the Flying Elephant®, It’s a Small World® and Jungle Cruise®. Ride the Seven Dwarves Mine Train® and dine in the Beast’s castle at Be Our Guest restaurant, both located in New Fantasyland®. Head to Epcot® for Innoventions, Frozen Ever After® and Soarin’®. See Fantasmic!, Beauty and the Beast Live on Stage and Muppet*Vision 3D at Hollywood Studios®. Animal Kingdom® is home to Walt Disney World’s® newest attraction: Pandora – The World of Avatar®. Stock up on Disney souvenirs at Disney Springs. It features a variety of shopping and dining options. SeaWorld offers animal shows, experiences and rides. Encounter dolphins, penguins and sea lions. Immerse yourself in the movies at Universal Orlando®. Universal Studios® features rides based on E.T., Transformers, Shrek, The Mummy and Despicable Me. Universal’s Islands of Adventure® has Jurassic Park and an entire land dedicated to Harry Potter! Kids stay free! Children under 18 years old stay free when using existing bedding. Shopping and dining district of Walt Disney. Tip: Stay here to get a dose of Disney without paying for park tickets. Distance: 19 miles to airport. 1.5 miles to Disney.